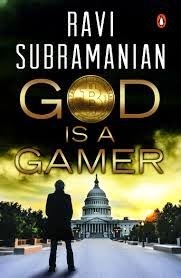 I just finished reading God Is A Gamer by Ravi Subramanian. Let me tell you before I give my review, that I am reading Ravi Subramanian for the first time. And will read all his other books as well. God Is A Gamer opens with narratives from multiple cities including Mumbai, New York, and Washington DC, with multiple characters and parallel stories running through almost two-thirds of the book. Satoshi Nakamoto , bitcoins and online gaming are the terms that one can expect to come across in the novel frequently. Senator Gillian Tan is introduced to us. Favors given by the senator to Visa and MasterCard and favors in return to stop funding the Wiki Leaks. That was quiet an introduction to the senator Gillian Tan. Gillian Tan, on his way to meet the president, is killed. Meanwhile, Swami, the Retail Head of NYIB bank in Mumbai is unveiled to a message scam that fools customers and acquires the money deposited in their bank account. This bought to Malvika’s notice,Swami’s boss. Swami and Malvika share a strained professional relationship. Then we are introduced to Aditya and Sundeep who run a gaming company and are closely associated to Swami and the bank. In the consecutive chapters,Aditya’s son, Varun and Tanya are introduced . Love sparks between them and meanwhile senator’s assassination had taken a back seat. There takes place an ATM heist, and the detectives start linking the assassination to the heist. The plot is intertwined, and irresistible. Language is simple, and connects to the readers by giving importance to social media, usage of smart phones and craze of gaming among youth. A treat to the technologist, the book tries to fascinate the readers by using real names at times. There are a lot of sub- plots, yet just a single plot. I could guess the further part of the book , 100 pages before, but read on because it was irresistible and wanted the answers for a few loose ends, which are still unanswered. Overall, it is a good read, and worth reading!